It’s no secret that countless students like to live it up on the weekends at local bars like Hyde Park Cafe, which is open to those over 18, but if you are 21, the cover charge can be $15 cheaper. In order to attain all the perks of being a 21-year old, many people purchase fake IDs from countries like China, where they are easy to order from online websites. Others resort to local fake ID distributors, who are usually found by word-of-mouth. Legacy Production Group bouncer and UT senior management major AJ Desatnik says fake IDs are easy to identify depending on the state. The most popular fake IDs attempt to replicate states like New Jersey, Connecticut, Massachusetts and Pennsylvania because they are the easiest states to create, Desatnik said. When a fake ID is presented, Desatnik said, bouncers are supposed to turn both the ID and person presenting it over to the police, but that’s not always the case. “If they are polite and quiet about it, most bouncers would give it back,” Desatnik said. Needless to say,their entrance to the venue is subsequently denied. 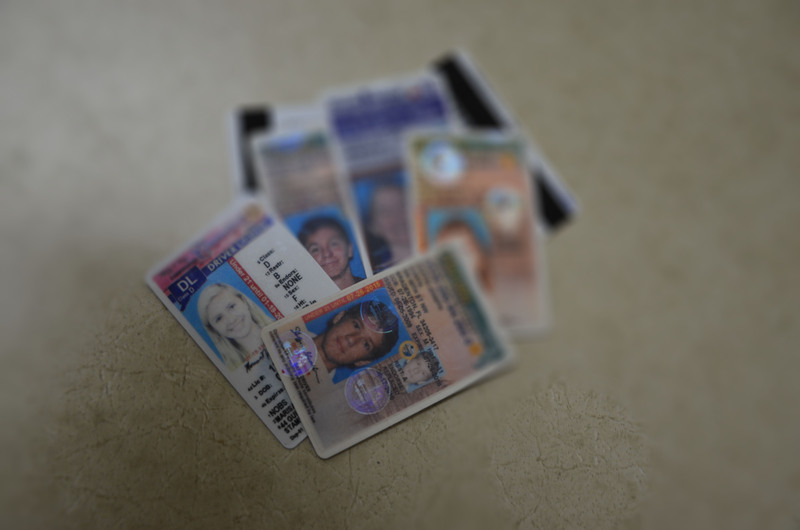 A sophomore at UT, who prefers to stay anonymous because she is breaking the law and the university policy, said that she has a variety of fake IDs, and has had up to six at one time. She also frequently uses her friend’s old IDs to get into clubs and bars. Despite getting into many bars with her fake IDs, two of her previous fake IDs have been confiscated. The anonymous student said that she thinks that owning a fake ID is worth the risk of getting in trouble with UT or the law. MacDinton’s Irish Pub & Restaurant’s co-head of security and UT alumni Jeff Phillips says MacDinton’s has a binder filled with fake IDs that people have tried to use to get into the venue. “We may go a couple of weeks with no [fake ID’s presented] and then we might get as many as 10 in one night,” said Phillips. People under 25 are required to present two forms of IDs when entering MacDinton’s, the first being state-issued or government-issued. The second ID can be another form of picture identification, such as a Spartan Card. According to Phillips, more UT students attempt to present fake IDs than do students from neighboring colleges. “We get a lot of customers from USF and it doesn’t seem as common for them to have fake IDs, like UT students,” said Phillips. In the state of Florida it is a felony for an individual to own or use a fake ID, or attempt to use another person’s ID card. Owning a fake ID or using someone else’s ID breaks UT’s identification policy. “You’re in college and want to party, but does the risk outweigh the benefits?” Desatnik said.